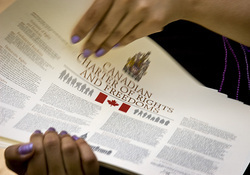 Social Studies 11 is the study of Canada in the 20th Century. General themes in our course include the evolution of Canadian identity and responsible citizenship rooted in an understanding of the historical, physical, political, legal, economic, and cultural factors that have affected Canada and the world. We will also examine the impact of humans on the environment on various scales, and analyze current events as they relate to the roles, rights, and responsibilities of Canadian citizens. Drazen Petrovic and Vlade Divac were two friends who grew up together sharing the common bond of basketball. Together, they lifted the Yugoslavian National team to unimaginable heights. After conquering Europe, they both went to America where they became the first two foreign players to attain NBA stardom. But with the fall of the Soviet Union on Christmas Day 1991, Yugoslavia split up. A war broke out between Petrovic’s Croatia and Divac’s Serbia. ESPN-Once Brothers from Nikola Angelovski on Vimeo. prosecution and a journalist reporting on the events for the press. Perhaps the best pilot in the World War II-era Army Air Force, Col. Paul Tibbets entered history as the pilot of the B-29 Superfortress Enola Gay, which was the aircraft that dropped the atomic bomb on Hiroshima. He later became a Brigadier General in the U.S. Army and died November 1, 2007 at the age of 92. Below you will find two documents that will help you throughout the WWII Final Activity. 1.Please download and use "how to write a news article" and fill in and hand-in for your rough notes. 2. Please refer to "web sources for canadian battles in WWII" for some useful websites as a starting point for your research. Aftermath: Population Overload from Jeridoo Universal Film Festival on Vimeo. Reminder to work on your Review Booklet for the Final Exam!!!!!!! !